Let's talk counter tops, shall we? If I'm being honest, I'll admit that I lust after Carrara Marble counter tops but live a Granite lifestyle. I love the look of Carrara but not as much as I love red wine. I am notorious for leaving a trail of drips around the kitchen as I cook, letting my coffee slosh out of the lid leaving a venti size ring or splashing soy sauce as I gleefully dunk my tempura roll. I just can't with Carrara. Apparently, visit every.single. stone yard in the state in the search of a white based granite with grey striations and very little speckling. The signature look of Carrara marble is a white based stone with very light grey striations. Marble is an incredibly soft, porous stone that is very prone to staining, chipping and developing a yellowing or patina over time. This makes it an ideal bathroom counter top for me (we had a Carrara counter top in our bathroom in our Maine house) but a terrible kitchen work space surface for our lifestyle. After tons of researching (ie, Pinteresting and Googling), it became clear that finding granite is really an in person job. Each rock produces slabs with their own characteristics, meaning that slabs with the same name can look different from one another. I should also note that while we were searching for granite because we were told that it should be half the price of marble, that is not necessarily the case. Granite is ranked by Levels and the price is based on the Level. We ended up with a Level 3 granite that costs just slightly less than marble. We also considered Quartzite and the price of Quartz and Quartzite can vary greatly as well. White based granites are super popular right now and can be hard to find. 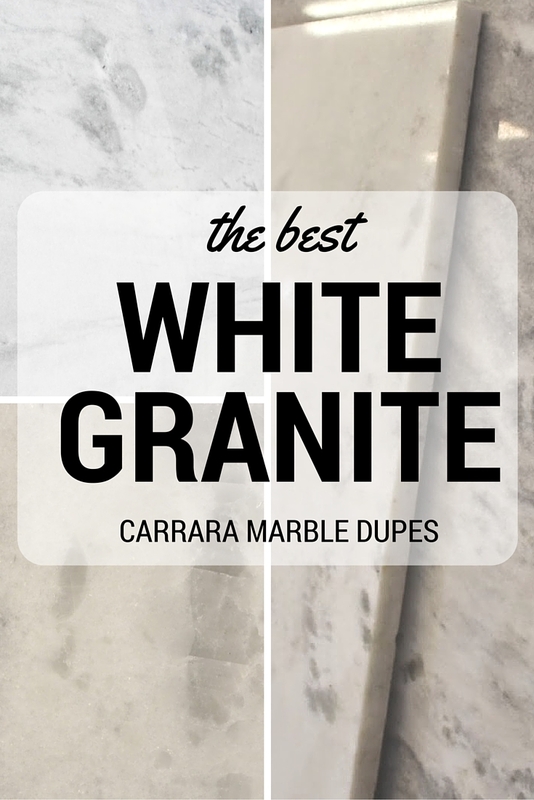 Lucky for you I've rounded up three of the best granites that are the perfect dupes for the look of Carrara Marble. Himalaya White is a light grey granite with striations of darker greys. This granite has more speckling than I was hoping for and has a bit busier of a pattern than Carrara Marble. If I'm not mistaken, this granite is a Level 2 making it a bit lower in cost per square foot than the other granites that we considered. In my (humble) opinion, Shadow Storm was the absolute closet dupe to Cararra Marble in a solid stone. As always, one slab can look completely different than the next, but the overall look of Shadow Storm is a white granite with pearl and light grey striations. There is almost no speckling in Shadow Storm and what speckling there is an almost glittery white pearl color that is only noticeable when you look very closely. I thought the pearl actually added a really pretty dimension that would have been gorgeous with white cabinets and back splash. Sadly, all of the slabs of Shadow Storm were spoken for and the stone yards can never know what is coming in and when so we had to continue the search. 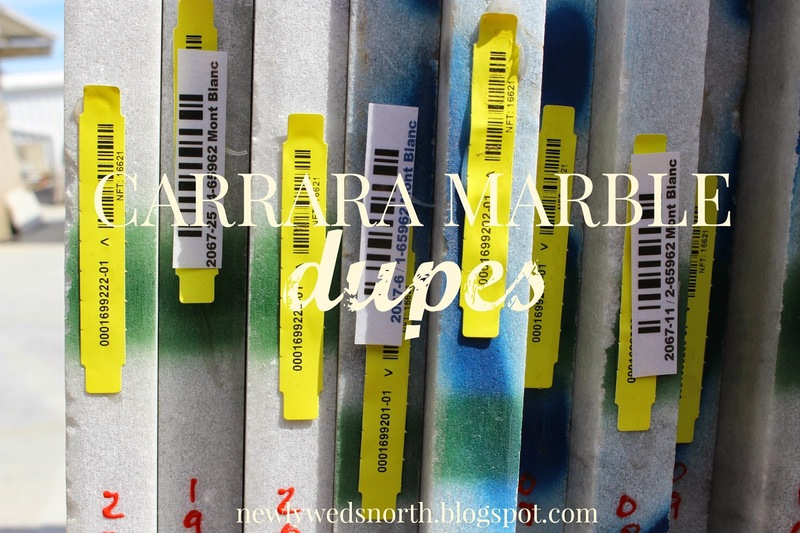 I'm glad that we did because we found the perfect granite dupe for Carrara Marble! The slab above is exactly what the slabs headed to our kitchen will look like. We hope to use the spaces that have the round markings (as opposed to the long, marble like striations) as areas for the sink cut out to minimize the "granite" look of the stone. Monte Blanc can be much lighter than our slabs - the below slabs and remnants are all Monte Blanc and are certainly much lighter than ours. Don't let those crazy vertical marks scare you - they are the fabricator's marks for measurements and cutting. In some of the slabs of Monte Blanc there are some light brown striations (look closely at the bottom of the piece in the photo below). Our particular slab has much more grey and almost zero brown but it's worth mentioning that some of the pieces have a brown streak or two. I'm really excited (and relieved) that we've settled on a granite for the reno. Dragging a baby around to stone yards is less than fun but we learned a ton throughout the process. I'm hopeful that we made a great choice and the vision that I've dreamed of comes to life as soon as that gorgeous island is installed. Early on, it seemed like we were completely striking out on finding the look we were hoping for in a granite surface so we began to consider some out of the box options. We decided against this stone simply because I was afraid that the gold tone would look very yellow against our all white cabinetry. If we were doing dark wood cabinets, I would have loved the look of this stone for our design. As you can see from that handy little sticker, the Champagne Quartzite was on the higher end of the price scale but still durable like granite and not high maintenance like marble. Sea Pearl almost made the cut. I fell in love with the deep grey swirls and thought that it would really make a statement in our all white kitchen. The color and details of the stone are hard to describe but it is named perfectly - it's a salty, swirly, ocean-during-a-thunderstorm toned grey that really could have been spectacular. Looking back on the photos, I still love Sea Pearl. I hope that slab finds a good home! Am I high on demo fumes or did we get somewhat close? If you'd like to see how our counter tops have held up exactly one year after our renovation, check out this follow up post! Well now you're making me do the lusting... ;) Love your choice and can't wait to see it installed! My darling dear. Heck yes. I might be hitting you up for more deers if our kitchen needs a reno. You know, in the one of the future home in Charlotte that we don't own that is surely not on the market yet. That one. I love the one you settled on. I totally would have chosen that one too. Your kitchen is going to be so fab! I see you went to SlabCo in Elberton. They have the best stuff! It’s interesting to see that you found granite stone alternatives for the Carrara Marble that you always wanted. Marble could be very high maintenance because of how it reacts to stains and scars, as the stains stay in the stone while the scars may potentially affect the stone’s look. But with granite, like the Monte Blanc, which is slightly more durable and low maintenance, the countertops that you are planning to build may last a little bit longer and it wouldn’t stain much compared to marble. Thank you for sharing your experience, Stephanie! I was just wondering, how to find these selections, I can't find any of your choices at the granite suppliers in Columbus Oh? Are some only available in certain parts of the country? I can't find any of these color selections in Columbus Oh at the granite suppliers? Any ideas on how to find these? We chose a special lot of Taj Mahal Quartzite for our kitchen and love it. Yes it was a splurge but everyday I look at those counters and it makes me sooo happy! We never saw this type of white granite or I would have gone in that direction. Great choices for your kitchen, you have amazing taste! My wife and I both agree that granite really looks nice in the kitchen. We live in an older home and the kitchen needs a big makeover. If we ever save enough money and decide it is time to redo the kitchen, we will most definitely go with a lighter color granite counter top. To follow up on your comment, I too have been told that Mont Blanc is a "hard marble" or at best a "soft quartzite." Mont Blanc is my absolute favorite, and I am in love with a slab I found, but I am very nervous about the maintenance, durability, etc. Stephanie, how is yours holding up? Any complaints, etc. I was also informed by a very knowledgeable stone yard that both Mont Blanc & Shadow Storm are, in fact, marbles. Based on the discussion and samples that they gave me to test, I ultimately decided to stick with my top choice, Carrara! Hey there, thanks for your feedback! As I've mentioned previously, both names are often used for multiple types of natural stone surfaces. Our counter tops are, without a doubt, Level 4 granite in Monte Blanc - we've lived with them for almost 2 years now and I can assure you that we treat them like granite. They do not stain, chip or have "soft spots" like a marble (which we do have in other surfaces in our home). Thanks for reading!